This trolley mounted 10kva generator has a choice of six 110 and 240V outlets, ideal for powering a variety of tools and lighting equipment on large sites. Our 20-50 KVA generators are reliable and powerful machines designed for professional use to support electricity mains failure or serve isolated locations. They are all easy to transport, install and store thanks to their compact design. 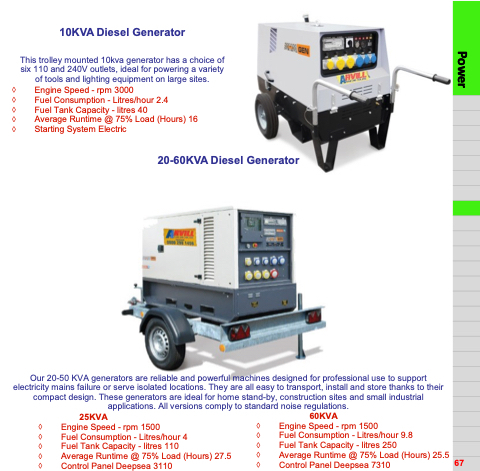 These generators are ideal for home stand-by, construction sites and small industrial applications. All versions comply to standard noise regulations.